Gwadar’s port city, a hub of the China-Pakistan Economic Corridor, suffers from continuous water crisis. There is citizen unrest against the authorities and the "tanker mafia". Gawadar port is a small town near the Iranian border on Arabian sea in strategice Persian Gulf. Due to climate change and persistent drought in the region there is shortage of water supply which was further escalated after arrival of many workers from China and other parts of Pakistan, when it became part of China Pakistan Economic Corridor. Where the port has been leased by Pakistan to China for 40 years, the extreme shortage of drinking water supply has caused protest in the town. Water comes from Mirani dam to Gwadar. The Mirani dam is in Kech District in Balochistan province in the Central Makran Range. It has itself a history when it was created against desires of the proposal of residents in 2001.On the night between June 26 & 27, 2007 the backflow water from Mirani dam inundated upstream areas destroying several thousand houses, and indigenous underground irrigation channels, displacing thousands of people, which were not compensated for. Water is transported by oil tankers to Gwadar which is hazardous for health. These water tankers belongs to private companies and they supply water to residents. These water suppliers have become in itself a mafia and sell water more than normal rate. Many new dams have been constructed on Makran but due to shortage of rainfall it is not a viable solution. Residents of the area are struggling to find a drop of water. This has caused spordic protests all around Gwadar. Last November 2017 protestors went to Karachi city where they protested in front of Karachi press club and later blocked the main Syed Hashmi Avenue putting whole city at stand still at the time when prime minister Pakistan was visiting Gawadar for inauguration (1). The aim for Gwadar to become a regional commercial, industrial and shipping hub, as part of the ambitious China Pakistan Economic Corridor (CPEC) project. For over a decade, Pakistani officials have dreamed of transforming the small but strategically located fishing port of Gwadar into a duty-free port and free economic zone – Pakistan’s answer to Dubai. The corridor is designed to give China a shorter, more secure trading route, via Pakistan, to the Middle East and beyond, while also boosting Pakistan’s economy. However, as the press reports (1) (2) Gwadar resembles Dubai "mainly in one respect – it doesn’t have much water". “It hasn’t rained here for the last three years,” explains a local journalist, Sajid Baloch. (2). Abdul Rahim, who works for the Gwadar Development Authority, under the provincial government of Balochistan, said climate change is playing a role in Gwadar’s thirst. Nearby Akra Kaur reservoir dried up two years ago, and water must now be brought from a more distant source, he said. Some of the water coming in is contaminated, leading to an increase in waterborne illnesses such as hepatitis, he added. Tapping groundwater isn’t a solution. “There is no point in digging wells as the underground water is all brackish,” Rahim said.(2). Muhammad Ali Kakar, the province’s planning and development secretary, told a government committee in December 2017 that the total demand for water in Gwadar city was 6.5 million gallons a day, but tankers supplied only 2 million gallons.(2). To help solve the water shortages two desalination plants have been built in the port, with Chinese expertise. The smaller can provide 200,000 gallons of potable water per day to the port, while the larger one, recently completed in the adjacent duty-free zone, can supply double that amount. Both plants rely on power from generators, as there is not enough grid power in Gwadar to run them, said Sajjd H. Baloch, the director general of Gwadar Development Authority. Some fishermen say they now buy clean drinking water from the port, paying up to 50 Pakistani rupees (around $0.40) for a three-litre can. Gul Mohammed, the operations director for the port authority, said his agency was willing to supply clean water outside the port and duty-free zone, but would need to be paid to produce it. “We are willing to provide water from the larger plant to the city of Gwadar at the rate of 0.98 rupees per gallon, but the Government of Balochistan has to sign an agreement with us,” he said. The provincial government is reluctant to accept the offer, hoping for rains this year to fill the Akra Kaur dam, Rahim said.(2). The Pakistani army, tasked with protecting the CPEC project (China Pakistan Corridor) meanwhile, also has laid the foundation for a large desalination plant to be built with help from the United Arab Emirates and Switzerland.The plant, to be completed by July 2018 will provide 4.4 million gallons of water a day, free of cost, to the inhabitants of Gwadar city, according to an army press release. Providing better services, including clean drinking water, is seen as a way of helping win local support for the development push – and to help quell an ongoing insurgency by Baloch separatists in the province. This tanker-mafia — as most citizens call it — has benefited enormously from the water shortage. 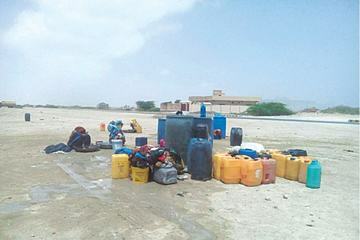 The contractors have repeatedly stopped supplying water over payment disputes holding the citizens of Gwadar de-facto hostage, forcing the citizens to take to the streets. 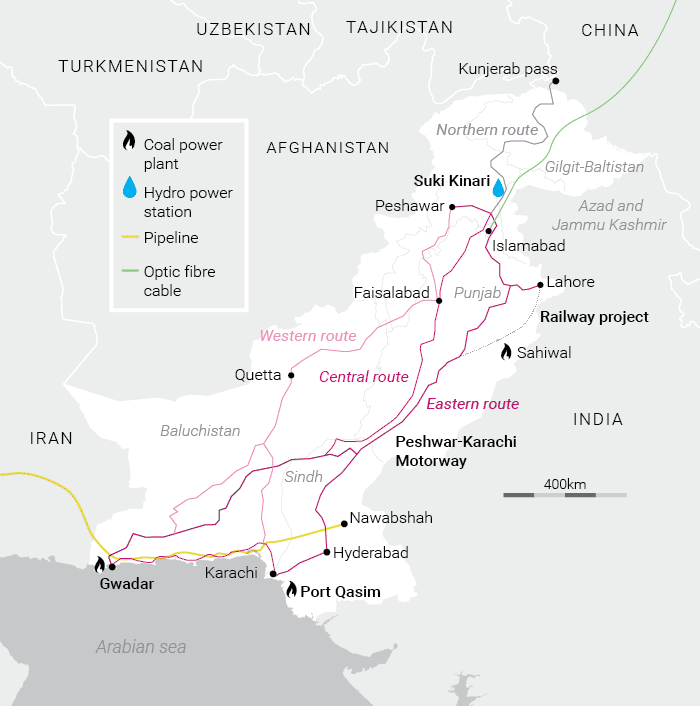 Struggles and protests over water are not new in Balochistan, but the repeated standoffs in Gwadar have become a major flashpoint amid rising tensions accentuated by ineffective governance, as well as growing poverty and inequality. This has now become an almost everyday story where the government stops payments for a time and in response the tanker-mafia announces a strike, which in turn triggers a citizens protest. (3). Part of the problem is that the government has so far not come up with an effective solution to the ongoing water crisis. During the last 20 years, Ankara Kaur Dam was the main source of water for the city but recently it dried up completely because of low rainfall and a massive build-up of silt.(3). With federal and Chinese funding, three new dams were completed in the last two years: Sawad, Shadi Kaur and Belar. But none have been connected to the city through pipeline systems so far. Desalination plants could be a more long-term solution. Water-tankers remain the only solution for now and while there is no shortage of funding, there is clear lack of interest in permanently solving this ongoing issue. In other words, if the scarcity of water is driven by lack of water, it is equally driven by lack of effective governance and money making (3). Project Details Gwadar port in Baluchistan province is a main feature of the China-Pakistan Economic Corridor, and key to the belt and road initiative. (4). China Overseas Port Holding Company plans to expand Gwadar Port, constructing nine, new multipurpose berths along 3.2km of seafront to the east of the existing berths. Pakistan awarded the contract for construction and operation to China in 2013. Gwadar Port will provide an alternative route to the Malacca Strait (4). The corridor starts in Kashgar is an oasis city in China’s Xinjiang region with a history stretching back more than 2000 years. The city served as a key trading post along the historical Silk Road. It goes through Gilgit-Baltistan, part of the Kashmir region, which is disputed by India and Pakistan. An estimated 1.8 million people live in the highly mountainous region which covers an area of 72,971 sq km. Trade and tourism are the main economic activities of the region. 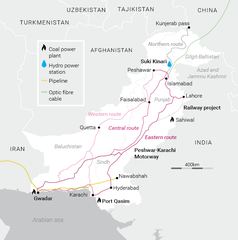 China boosted investment in 2009 by signing an agreement with Pakistan for a major energy project which included the construction of a 7,000-megawatt hydroelectric dam (Suki-Kinari). The corridor continues to Islamabad, Karachi and the new port at Gwadar(4) a small town near Iranian border on Arabian sea in strategice Persian Gulf. Due climate change and persistent drought in the regiion there is shortage of drinking water supply. which was further escalated after arrival of many workers from China and other parts of Pakistan, when it became part of China Pakistan Economic Corridor. Last November 2017, protesters from Gwadar traveled all the way to Karachi, Pakistan’s largest city, where they protested in front of the Karachi Press Club. When this proved insufficient, the protesters also blocked a main traffic artery, the Syed Hashmi Avenue, and forced a city-wide strike to protest the water crisis during Prime Minister Shahid Khan Abbasi’s visit to Gwadar to inaugurate the newly constructed Marine Drive road. Once the tanker companies were paid, they started to truck in water again. (3). Right now, the Gwadar peninsula – a hammerhead-shaped projection of land into the Arabian Sea – is home to about 100,000 people, following completion of the first phase of the port development. But as development continues, the area’s population is expected to grow to 500,000 by 2020, according to the port authority’s website. (2). On one side of the peninsula is the deep-sea port, built by the Chinese state-owned China Overseas Holding Company. On the other side lies the local harbour. Fishing was Gwadar’s main economic activity before the port started operations, and some local people say they so far see little benefit in the government’s grand plans. “We are dying from thirst, there are no doctors in our hospitals, the electricity comes and goes and there is garbage everywhere as no one collects it,” complained Rasool Bux, a fisherman who lives near the harbour.(2). “First fix all these problems. Then develop this dream of Dubai,” he urged. Relevant government actors Gwadar Development Authority. Other High water prices charged by the so-called "tanker mafia". Development of Alternatives Desalination plants and new dams. Why? Explain briefly. There is no immediate solution to shortage of water. While the China Pakistan Corridor (stretching to the new port of Gwadar) attracts inventment and work opporunities, the port city has no facilities for such an increased population, and it lack water, which is brought in tankers from the Mirani dams at an expensive price charged by "the tanker mafia".